Welcome to the Stillaguamish Valley Genealogical Home page. This was the first schoolhouse built by School District No. 83. The Stillaguamish Valley Genealogical Society and Library, serving Snohomish County and the Arlington, Washington area, has grown to include thousands of genealogical and historical books, microfilm and microfiche sets, and Internet access to free genealogy web sites. 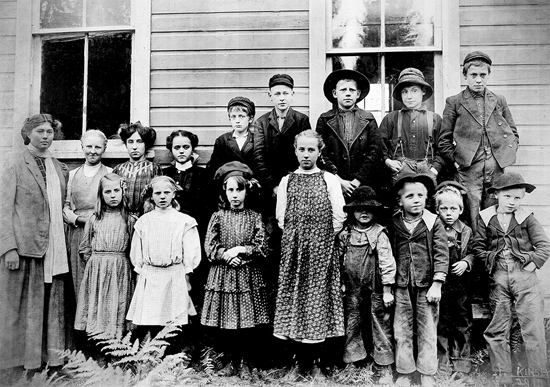 Our library is a depot for historical information pertaining to north Snohomish County and the Stillaguamish Valley, and its native populations and early settlers. The collection also contains material for all U.S. states and many foreign countries. This information is available to members and visitors free of charge during regular library hours. Monthly Meetings - Visitors and Potential Members Always Welcome! Held on the second Tuesday of each month at 1:00 pm, check our events calendar for location. Hear speakers and watch programs on a wide range of genealogical and historical topics. Wheelchair accessible and is easily reachable from I-5 or State Route (Highway) 9. Meet members and gather information about the library collection during the break. Complete access to Members Only pages of our website - exclusive benefit. Access to subscription websites - exclusive benefit. Participate in field trips to research centers. Develop contacts with others who have similar interests. Discounted rates for certain genealogical research workshops - exclusive benefit. Receive the bi-monthly "Stillaguamish Star" newsletter by e-mail. There is an additional $10 yearly fee to receive the newsletter by regular mail. Individual: $20.00 (plus $10.00 if you want the newletter to be mailed to you). Lifetime membership: $150.00 (onetime, per individual, with no additional charge for newsletter by regular mail). Lifetime Professional: $350.00 (onetime, per individual, with no additional charge for newsletter by regular mail). We're always accepting new members. You can use our Online Join tab here on our website, call us at (360) 435-4838 or attend our monthly meeting and ask any participant to direct you to our Membership committee. The menu on our website has been rearranged and many of your favorite pages are now located under our Resources section. If you're looking for The Tombstone Project, Cemetery Records, Death Index, our Forums, or Surname Research, that is where you'll find them. New and used books of genealogical value. Old photographs (which can be scanned and returned to you). Items can be donated to the society in honor of or in memory of a loved one or can be lent to the Society for a specific amount of time. Call before you stop by our library when donating items in person to verify that someone will be there. Please do not leave items on the porch or inside the screen door. was made possible in part by assistance from the Snohomish County Heritage Program, for which we are truly grateful. Meet with fellow genealogists to discuss current events and genealogy over a cup of coffee. You may discover a new research method or just make a few new friends. Meetings are held at the SVGS Library at 10:00AM.